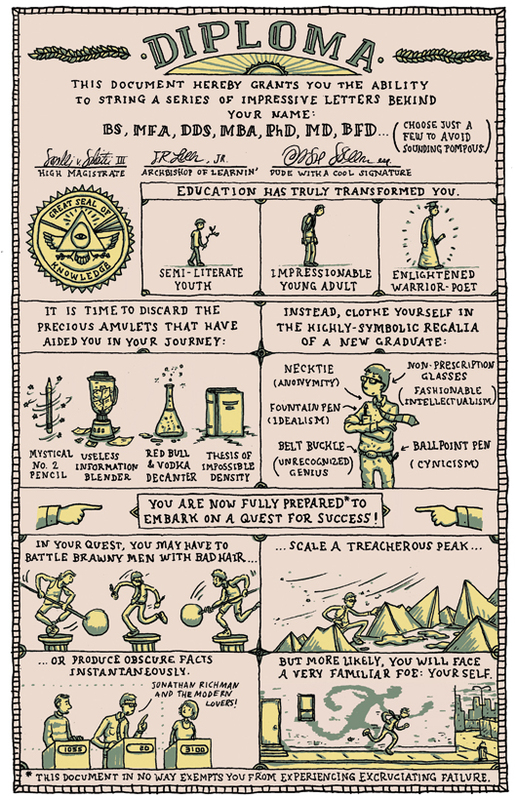 Graduation is fast approaching, a day that will bring this cartoonist much joy and this blog many commencement-related posts. Follow this link if you'd like to order a print for your own Class of 2011 warrior-poet. yes i have BBA! haha useless! So congratulations are in order? Hey, I didn't know you pulled teeth! Should have paid more attention. At least you have a specialty in case this cartooning thing doesn't work out...which I don't believe is going to happen. I'm sure you'll be as detailed in your dentistry as you are in your cartooning. Great job. so what is a BFD? I think I know.....but enlighten me. It was so good to see you at the wedding! HAHAHAHA! Great one. Thanks for sharing. Crosby: Thanks! I try to keep the my teeth world and drawing world separate, but they do occasionally collide. Jeni: BFD = big "freaking" deal. One of my professors actually had this behind his name on a presentation, so it might have another meaning. Either that or he has a good sense of humor. I've worked for dentists for over 20 years, and I can tell you're sense of humor is going to help tons!!! Good luck to you!! I love your blog, and your zany, sarcastic sense of humor. That's a very useful information you have posted here, I must say that your blog really made me think that to have a diploma in any field is becoming necessary now a days. Thanks for bringing this up here. I want to pursue a diploma from high standard college. Please help me in finding the best college which must be providing the best education for our best future.